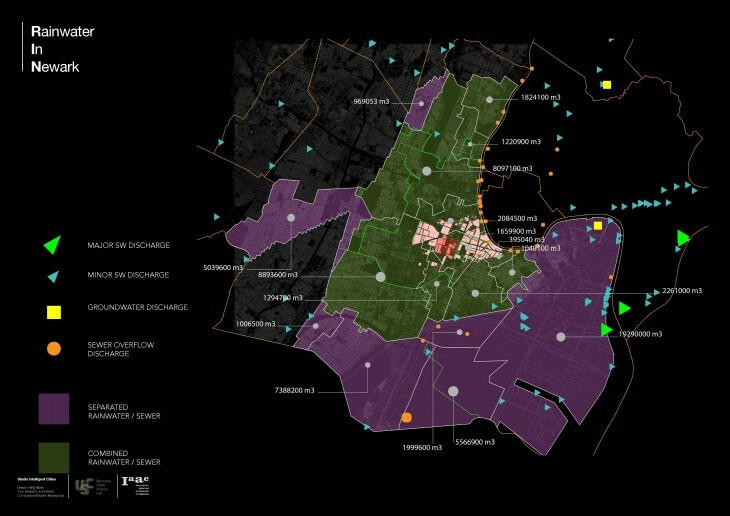 With the global trend of urbanisation on the rise, it is always necessary to be critical in the conception of urban conditions. As a basic condition for life, humans are all inhabiting the natural environment in one way or another. Our downfall occurs in our failure to learn and take advantage of our immediate natural environment, creating a separation of entities between the city and nature. 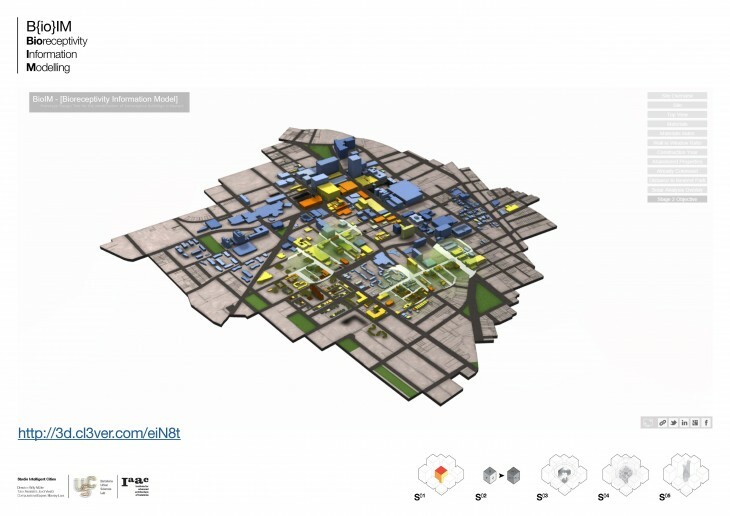 The city is prioritised as a machine to maximise its effectiveness and efficiency for productivity, creating consumer islands disconnected from the vital resources it bases its existence on. Nature is reduced to an object, used to fuel the machine, fill gaps and “attractions” for temporary escapes. In this sense we are creating our own cycles for these natural resources and our lack of understanding and respect produces a series of issues to within contemporary cities. As density and complexity rises in these cities it becomes very clear how inefficient these cycles are and how little it takes to set off a total collapse. Society takes for granted the cycle of consumption of resources due to a lack of awareness of the processes involved in the procurement and distribution. 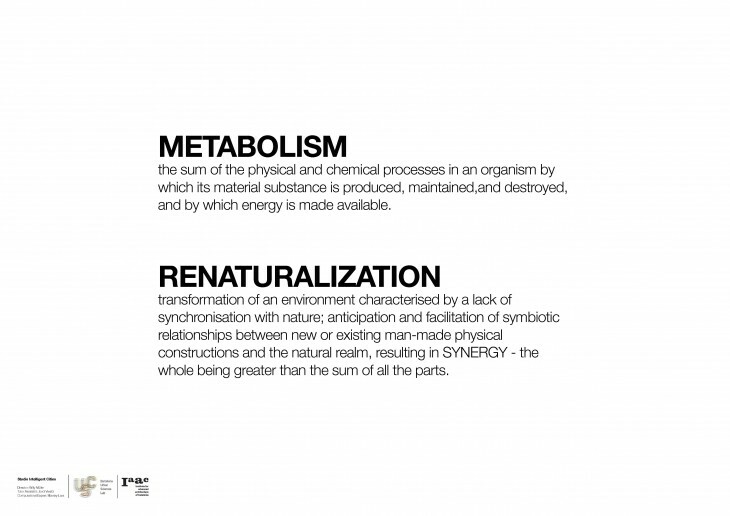 In the case for energy, production occurs outside the city to only be then transported into the city, which in turn consumes more energy in the process. An illogical use of energy is used unsparingly to help us create microclimates that appeals towards our standards of thermal comfort. In contrast, the same phenomena is resolved through the natural adaptation process for a tree. 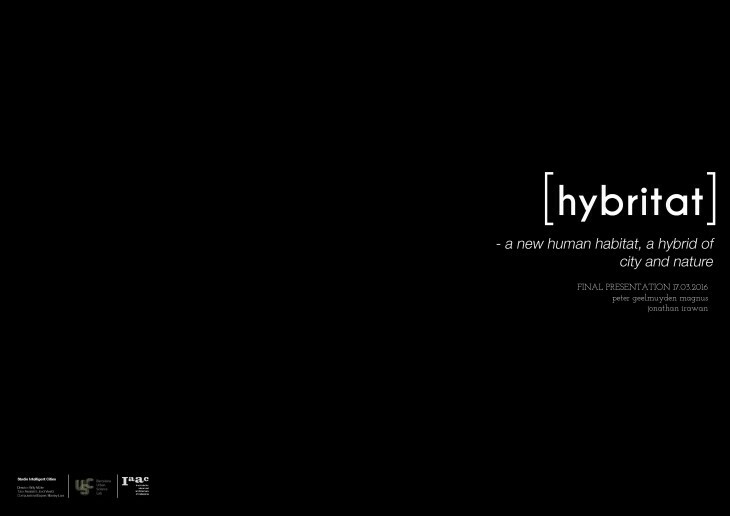 With this project we want to spark a discourse around a new type of city, a hybrid city that is neither city nor nature- but both, with the ultimate objective of closing these cycles and generating resilience and flexibility against contemporary global urban issues now and for future generations. Simultaneously, we want to explore new methods of deduce patterns and relationships of this desynchronisation through the observation of natural and urban phenomenas. 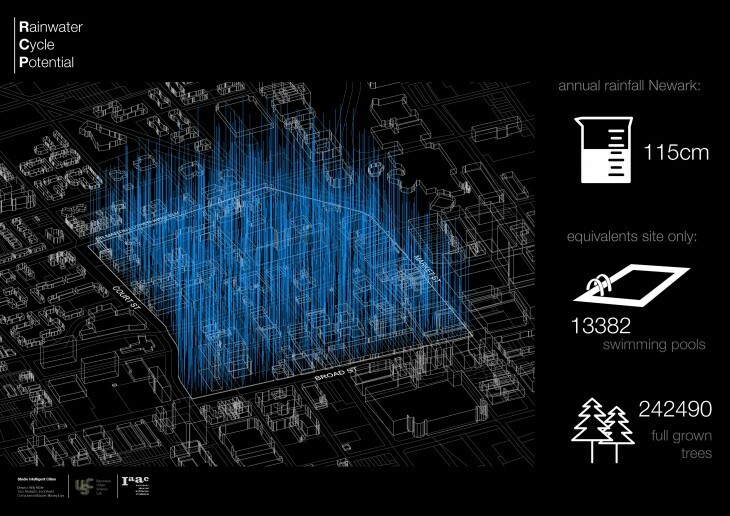 New technologies allow us to access real-time data which will enable us to experiment with new potential design processes, ultimately affect the outcome. 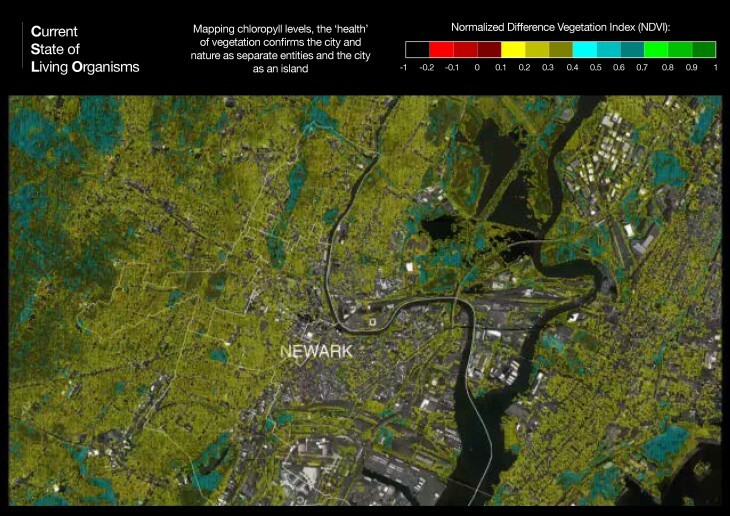 The site provided in Newark, New Jersey can become the prototype for our experiment as there is an abundance of accessible data in which we can start to isolate, manipulate and analyse. The city is currently in the process of revitalisation, generating the capacity and enthusiasm to produce drastic/radical change to guide its growth as “one of the nation’s major air, shipping, and rail hub”. 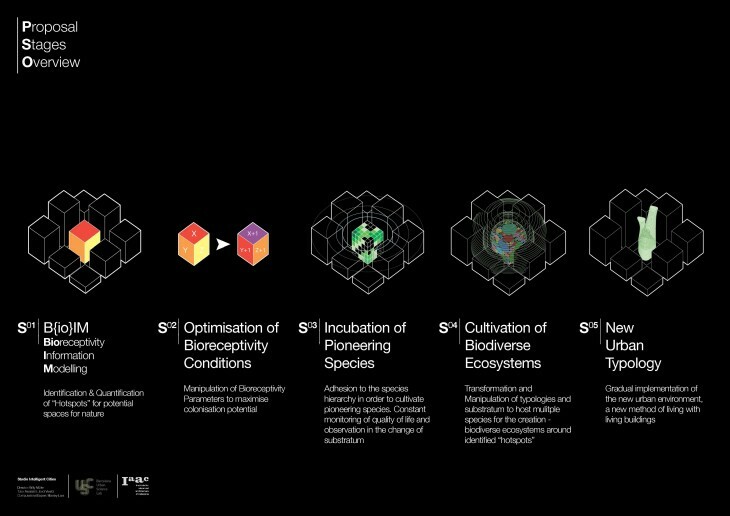 The outcome of our process may bring about change to how the growth can be guided in the attempt to once again create the harmonious symbiosis between man and nature, which may become the new archetype for urban living in the future. 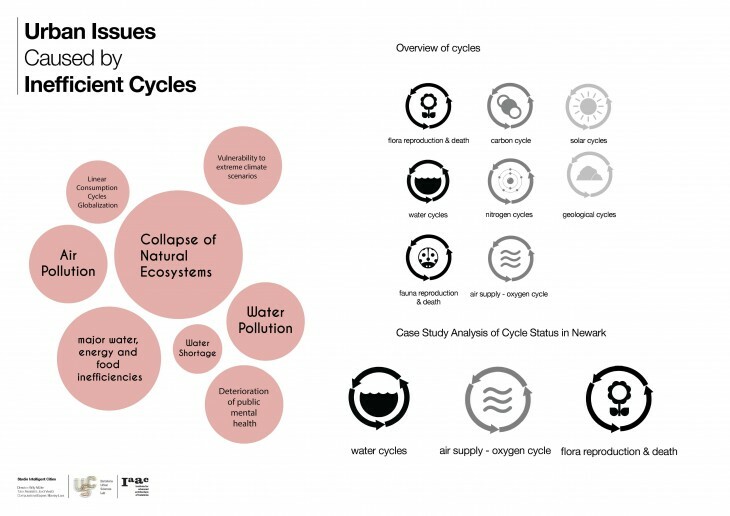 Inefficiencies and issues in urban cycles were explored in two case studies – water and flora reproduction and death. 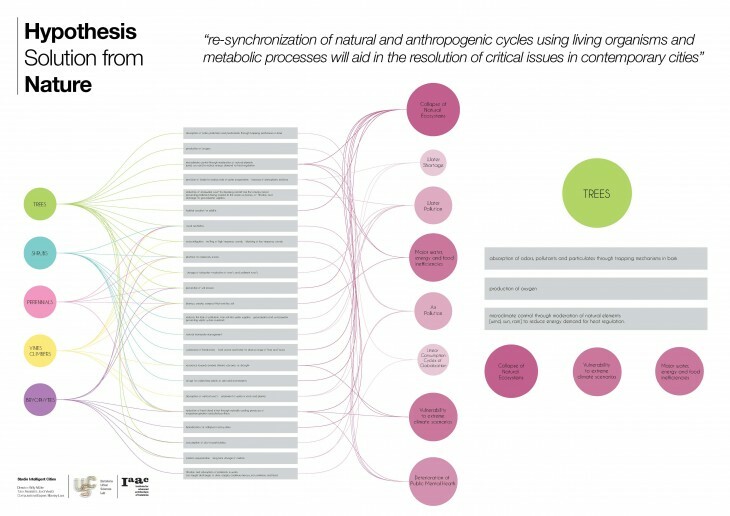 The flora reproduction and death cycle can also demonstrate the separation of entities between city and nature. 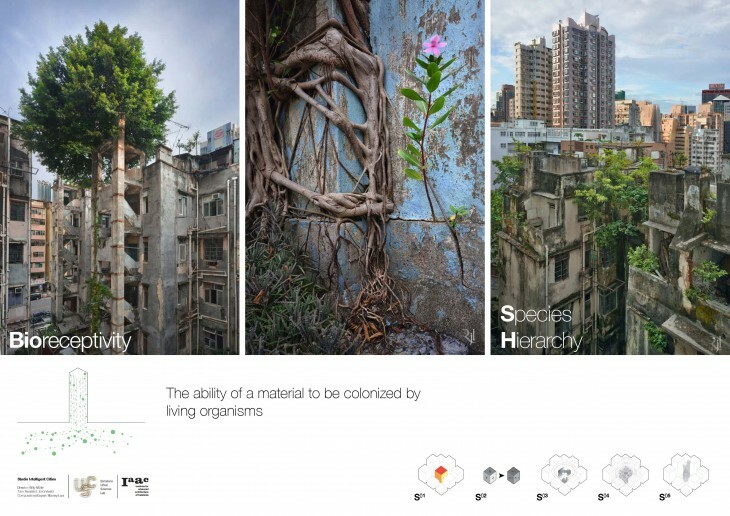 Cities consume nature. 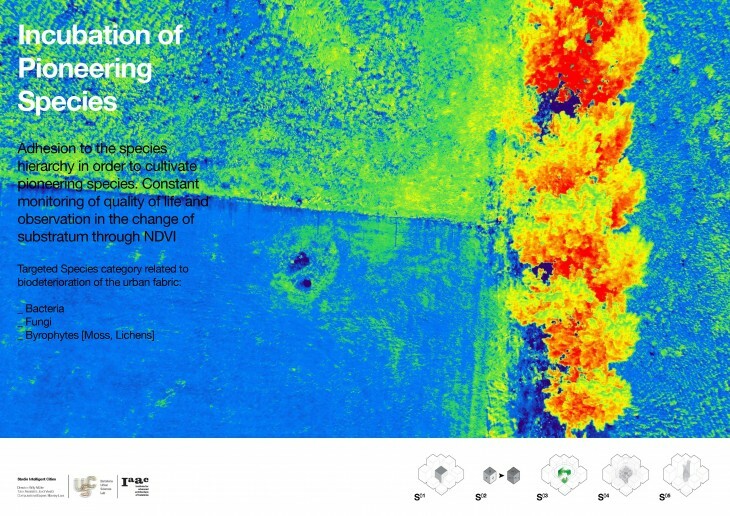 New technology of NDVI [ Normalised Difference Vegetation Index ] were implemented into the methodology of the project. This analysis provided information and insight into the “health” of the fauna from the analysis of certain colour bands within a photograph. By analysing the infrared channel and the red channel of a photo, we could see the amount of chlorophyll and photosynthesis capabilities of the fauna within the subject area. Water inefficiencies were also studied and explored. If we now know what we want to achieve, we need to start to analyse potential areas to explore and experiment with our process. 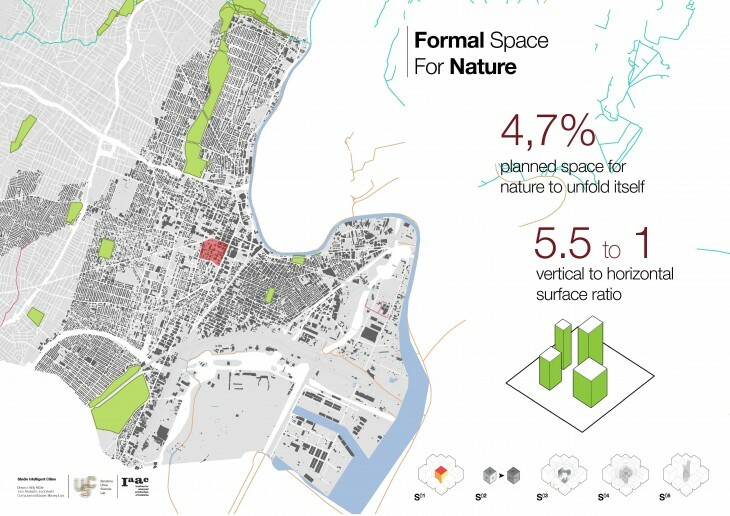 In Newark, zoned spaces for living organisms or flora is limited. There is high potential in the utilisation of vertical spaces. 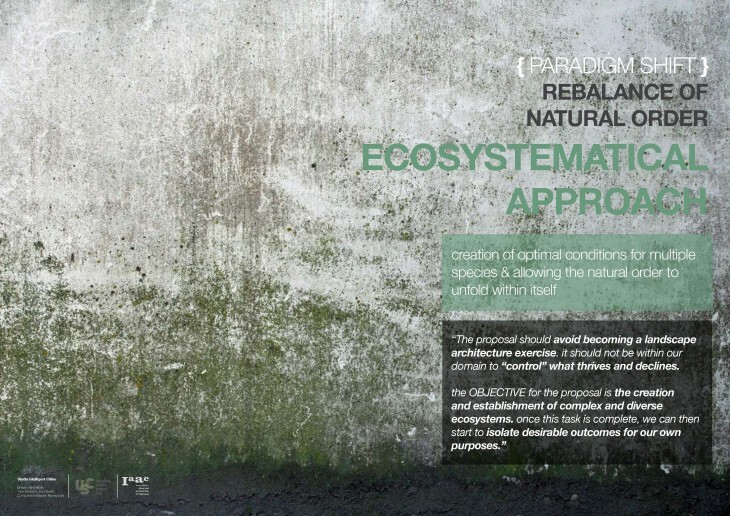 If we are to explore surfaces within the city as the new interface for nature, it necessary to study the ability of these surfaces to receive nature, the concept of Bioreceptivity. Video mapping of Stages of the proposal. This semester, our goal has been to establish stage 1 and stage 2 within the proposal workflow. 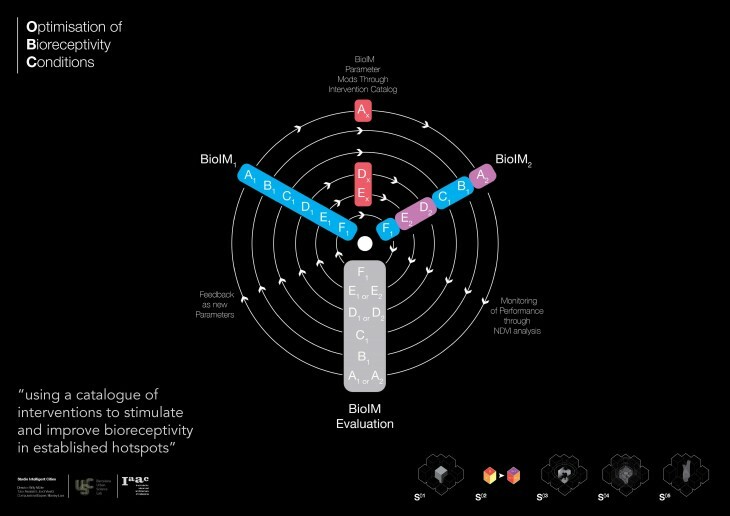 In stage 1, Bioreceptivity hotspots or clusters were identified using a design tool that we have created called BioIM – Bioreceptivity Information Modelling. Data was obtained from various sources including google streetmaps and the open source data policy in Newark. 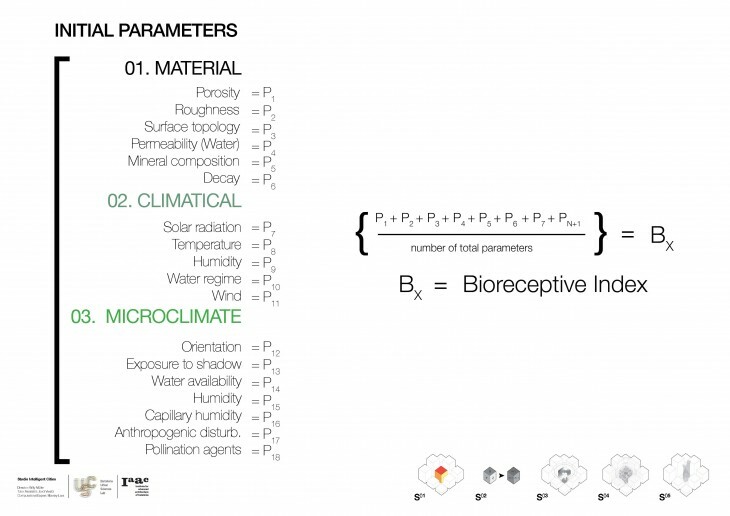 From this analysis, it is then possible to conceived an intervention catalog to modify the parameters of Bioreeptivity. In stage 3 – It is nature’s turn to start to colonise the receptive surfaces. It is our role to continue to monitor and incubate the pioneering species. 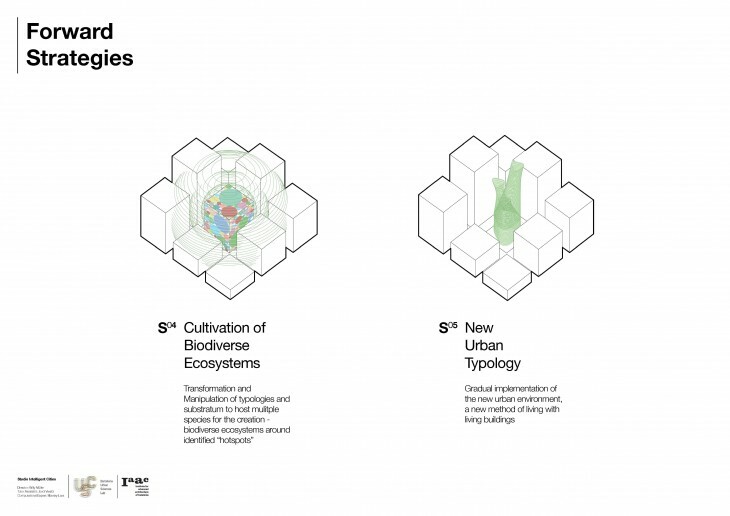 For last trimester, the forward strategies will involve the exploration of the symbiotic relationship between the new created urban typology with the method of human habitation patterns.